The Expressive Arts Group began as a program through the West Coast Mental Health Network. 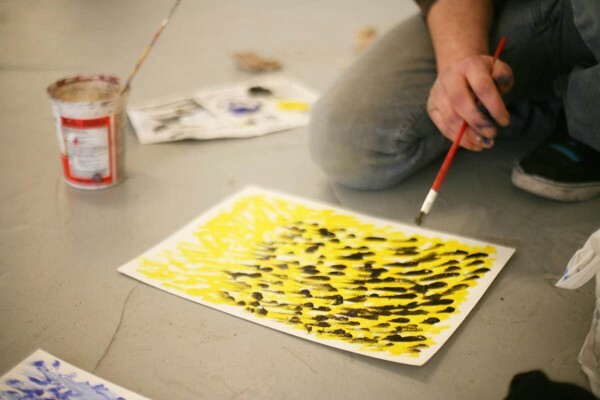 There are about 30 participants, who meet on a drop-in basis every Monday afternoon to paint, make collages, use mark-making tools, do print-making and/or sculpture. No previous art experience is necessary to participate in the group. We operate on the belief that engaging in creative activities is physically and emotionally healing. We provide art materials, instruction (if needed and desired) and support in an inclusive, accessible and safe atmosphere. Free. If you are interested in attending, please call 604-687-2468. Gallery Gachet is a unique artist-run centre located in Vancouver’s Downtown Eastside. Gachet is a collectively-run exhibition and studio space built to empower participants as artists, administrators and curators. Gallery Gachet is a non-profit artist run centre located in the Downtown Eastside. Your support will help us extend the range and quality of our programs. Click here to see our full accesibility audit. Want to subscribe to Gallery Gachet's monthly e-newsletters and receive monthly updates, opportunities, and promotions? You can unsubscribe at any time by clicking on the link at the bottom of our monthly newsletters. Check out our latest exhibition photos on Flickr. Become a member of our collective and find the resources you need to make your art.